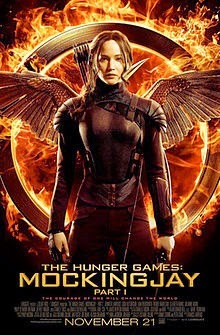 The Hunger Games: Mockingjay – Part 1 is an upcoming 2014 American science fiction adventure film directed by Francis Lawrence with a screenplay by Peter Craig and Danny Strong. It is the first of two cinematic parts based on the novel Mockingjay, the final book in The Hunger Games trilogy, written by Suzanne Collins, and the third installment in The Hunger Games film series, produced by Nina Jacobson and Jon Kilik and distributed by Lionsgate. The film stars Jennifer Lawrence, Josh Hutcherson, Liam Hemsworth, Woody Harrelson, Elizabeth Banks, Julianne Moore, Jeffrey Wright, Donald Sutherland, and Philip Seymour Hoffman. It is the sequel to The Hunger Games: Catching Fire and will be followed by the concluding entry, The Hunger Games: Mockingjay – Part 2. The story continues to follow Katniss Everdeen who, after escaping the Third Quarter Quell, becomes a reluctant hero and symbol of hope for the nation of Panem. Principal photography for both parts of the film began on September 23, 2013 in Atlanta, before moving to Paris for two weeks of filming and officially concluding on June 20, 2014 in Berlin, Germany. Part 1 is scheduled to be released on November 21, 2014 in the United States, and has landed atop Fandango's list of most-anticipated films for 2014.